Who invented the Steamboat? The name of the person credited with inventing the Steamboat is John Fitch (1743 - 1798). John Fitch is not only famous as the American inventor of the Steamboat but also as a clockmaker, engineer and gunsmith. When was the Steamboat invented? John Fitch invented the Steamboat in 1791, during the First US Industrial Revolution (1700 - 1860) period of invention. The invention of the Steamboat originated in America and is considered a major achievement in the field of American Transportation. Definition of the Steamboat: The Steamboat is defined as a boat or vessel propelled by a steam powered engine used for the transportation of goods and people via a river. Facts about who invented the Steamboat? Fact 1: Who invented the Steamboat? The Steamboat was invented by John Fitch in 1791 during the First US Industrial Revolution era of inventions (1700 - 1860). The steamboat was a significant addition to advancements made to the area of Transportation in the United States. Fact 2: Who invented the Steamboat? Prior to the invention of the Steamboat in 1791, there were small, cheap timber flat bottom boats with square ends called flatboats that were invented by Jacob Yoder in 1781. River travel using flatboats was typically one way. The flatboat could easily travel with the current of the river, but any travel in the opposite direction had to be done on land. Fact 3: Who invented the Steamboat? Flatboats were trading vessels used for carrying produce downstream to markets and the transportation of bulky freight, especially in shallow waters, such as the Mississippi River. Passengers taken on flatboats faced a slow and uncomfortable journey with only tent-like coverings for shelter. Fact 4: Who invented the Steamboat? Flatboats were extremely slow, lacking their own method of propulsion, using the current of the river to propel them downriver. Passengers taken on flatboats faced a slow and uncomfortable journey with only tent-like coverings for shelter. When a flatboat reached its destination the boatmen dismantled their 'flat' and sold it for lumber, then had to walk home. Fact 5: Who invented the Steamboat? The invention of the Steamboat enabled fast river travel both up and down river even against strong currents and increasing the speed river transportation and revolutionizing trade and travel. Fact 6: Who invented the Steamboat? The invention of the Steamboat was made possible soon after James Watt patented an improved version of the Steam Engine in 1769. John Fitch (1743-1798) used the idea of using steam power to propel boats and was granted a United States patent for a steamboat on August 26, 1791. Fact 7: Who invented the Steamboat? The inventor of the Steamboat, John Fitch, was born on January 21, 1743 in Windsor, Connecticut, United States and died on July 2, 1798. 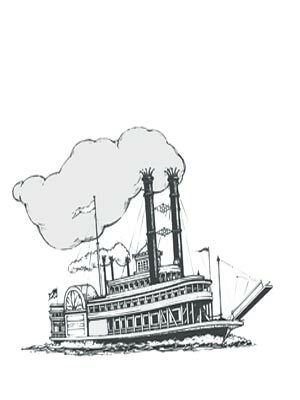 Fact 8: Who invented the Steamboat? The early years of John Fitch were spent in the British colony of Windsor, Connecticut, in America where he was raised on a farm. His father was Joseph Fitch and his mother was Sarah Shaler Fitch and he was one of five children. John Fitch received a limited formal education and was a self-taught man. Fact 9: Who invented the Steamboat? His first job was as an apprentice to a clock maker called Benjamin Cheany and he went on to learn brass making, the art of a silversmith, gunsmith, map making and surveying. Fact 10: Who invented the Steamboat? John Fitch married Lucy Roberts on December 29, 1767. The couple had one daughter but soon separated. Fact 10: Who invented the Steamboat? The Scottish inventor James Watt (1736 - 1819) patented an improved version of the Steam Engine in 1769 which would lead to the invention of the steamboat. Fact 11: Who invented the Steamboat? John Fitch established a brass and silversmith business in Trenton, New Jersey but his business was destroyed by British troops at the outbreak of the American Revolution (1765 – 1783). Fact 12: Who invented the Steamboat? After the war John Fitch was appointed a deputy-surveyor on the Ohio River in Kentucky. His boat was attacked by Delaware Indians and John Fitch was taken into a harsh captivity. He was turned over to the British, who eventually released him. Fact 13: Who invented the Steamboat? The terrifying experience at the hands of the Native Indians led to nightmares as John Fitch re-lived the scene of being pursued in his slow flatboat by the fast canoes of the Delaware Native Indians. He was inspired by the idea of inventing a fast, steam powered boat that could not be caught by paddling canoes. His idea led to his invention of the Steamboat. Fact 14: Who invented the Steamboat? John Fitch became the first man to build a steamboat in the United States. In 1787, John Fitch built a 45-foot steamboat that he sailed down the Delaware River watched by members of the Constitutional Convention in Philadelphia but he failed to get financial backing for his great invention. Fact 15: Who invented the Steamboat? John Fitch was granted a United States patent for a steamboat on August 26, 1791. He built four other improved steamboats that could travel at the astounding speed of up to 5 miles per hour, but they were expensive to build and still difficult to operate. Fact 16: Who invented the Steamboat? In April 1790, John Fitch and his partner, Henry Voigt established a steamboat company. The steamboats had a steam engine which turned a paddle wheel in back of the boats that powered the steamboats both up and downriver. The John Fitch steam boat provided a regular service between Philadelphia and Bordentown on the Delaware River proving that steamboat travel was viable, but failed to gain any new business. Fact 17: Who invented the Steamboat? Desperate for funding, John Fitch went to France to try and get some investors. He failed and, totally disillusioned, he returned to the United States and fell into a terrible depression. Fact 18: Who invented the Steamboat? The inventor of Steamboats, John Fitch, took his own life on July 2, 1798 and died in relative obscurity. His granddaughter, Josephine Cochran, continued the tradition of inventions in the family by inventing the first reliable hand-powered Dishwasher in 1887. Fact 19: Who invented the Steamboat? The first successful steamboat was the Clermont, which was built by American inventor Robert Fulton (1765-1815) in 1807. It was cheap to run and Robert Fulton unfairly became known as the "Father of steam navigation".